I featured some old celebrity caricatures in two earlier posts, and challenged readers to identify them. Luckily for me, there were some right answers– whew! I’ve rounded up another batch, so jump in and test your Idiot Celeb IQ. lotta moss, but they’re still rolling. 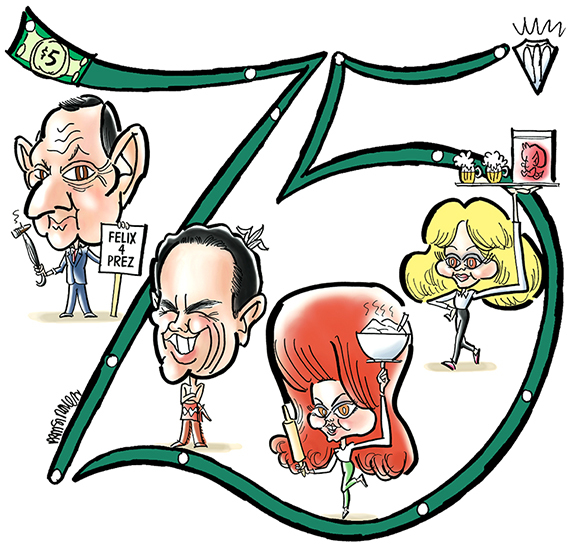 The illustration dates back to 2006, and was used as a timeline for an article about the 75th anniversary of Northwestern University’s student musical revue. All four celebs attended Northwestern. None stayed to graduate, but they all returned to be in a Waa-Mu show. 5. The Beatles; L-R: Paul McCartney, George Harrison, John Lennon, Ringo Starr. 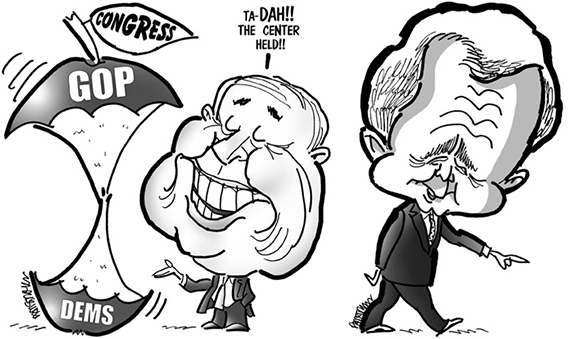 The drawing is a portion of a 1995 B&W editorial cartoon. 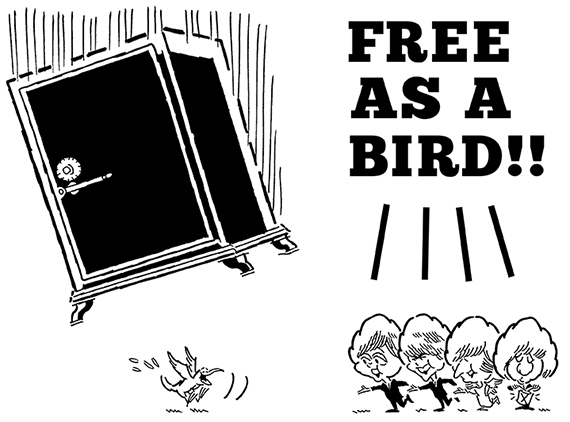 Free As A Bird was written by Lennon. He recorded a home demo of the song in 1977. The three surviving Beatles added additional vocals and instrumental backing to the demo in 1994. The final studio recording was released in 1995, 15 years after Lennon’s death– which explains why he’s portrayed as an angel in the drawing. 6. Movie tough guys; L-R: Chuck Norris, best known for playing the title role in the television series Walker, Texas Ranger; Arnold Schwarzenegger, best known for the Terminator movies; Charles Bronson, probably best remembered as the vigilante in Death Wish; Sylvester Stallone, best known for Rocky and its five sequels. he’s “playing” the drum with a knife and fork. Arnold is standing on a Snagglepuss rug– I have no idea why. 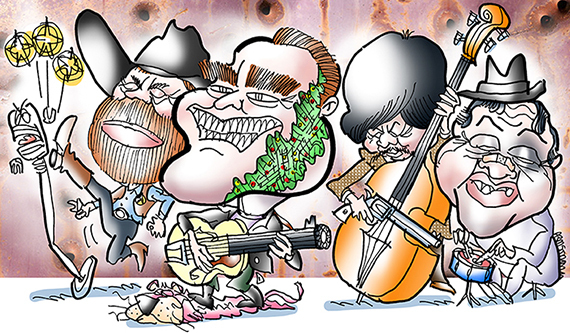 I did the illustration for Crawdaddy Magazine. Did you get any right? OK, how many?? How big do you think the bee was that stung Mick Jagger’s lips? Do you think Keith Richards spends too much time on his hair? Do you worry about big iron safes falling out of windows in tall buildings like they always seem to do in old movies? See The Caricature. Pretty Caricature. Think, Think, Think. Who It Is?? Nice to meet someone who speaks the language, and thanks very much for stopping by! I was guessing Food Network stars for #4. Since they were carting around food. Ha! The food connection, I see what you mean. The magazine article I worked from told a little bit about the shows that each celebrity was in. Felix (Tony) was running for President, Beatty played an Indian, Ann-Margret was somehow involved with mashed potatoes (the dance, maybe? ), and Shelley Long’s show had an exorcism theme. I’ve forgotten all the details– which is probably good! Thanks as always for your support, sir! I got five right. I thought that the cat Arnie was tromping was the Pink Panther. But Snagglepuss and PP could be body doubles. 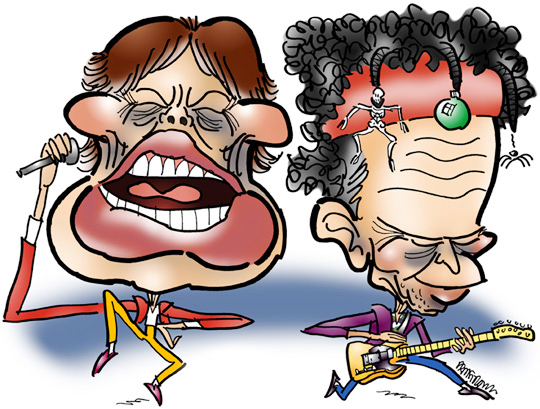 Mick and Keith were my faves. I love the little unexpected asides. They really make you pay attention to the characters. I must tell you, my dear Malvika, that when I read that part about Tiger Woods usually having a very bovine expression, I let out a roar like an elephant!! A tiger that looks like a cow– haw!! One of the funniest and keenest observations ever recorded here, and I’m still laughing!! I got the music ones, most of the tough guys, & some of the entertainers — not so well with the old sports or the U.S. politicians [ya know, my excuse being Canadian]. 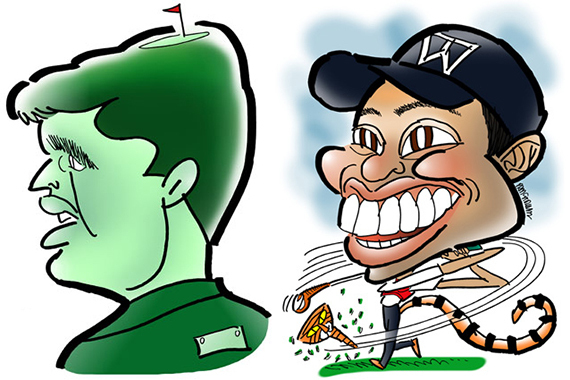 Thanks for a great brain test … I’m off to check out your other caricatures. My dear Vanessa: your wonderful comment has made me as giddy as a drunken man– as Old Ebenezer Scrooge once remarked after drinking too many root beer floats with Tiny Tim!! Thank you for that lovely compliment, and I’m so glad you enjoyed all the drawings. Caricatures have always (as you may have guessed!) been high on my own list of art favorites. As a kid, I used to marvel at all Mort Drucker’s astonishing work in Mad Magazine, and wonder: How on earth does he do it?? Well, it gives a lad something to shoot for, anyway! Wishing you all the best with your fashion blog! Mort Drucker! You definitely do him proud! You’re soooooo good at these!!!! Another Mort Drucker fan?? Excellent! I fear there are many today that do not know that most hallowed name in caricatures. I remember reading once, the opinion that he could perfectly capture anyone, but that he could never really be unkind. The necessary exaggerations were there, but his celebrity “victims” always loved the way he drew them. Now that puts him in a very unique category! Oh, yes! I started reading “Mad Magazine” when I was a little squirt. Thanks to Mort Drucker and Don Martin, I giggled my way through a lot of my childhood. I can imagine you fitting right in to that group. Oh, yes. Good ol’ Mad!! Somehow their movie satires were always ten times better than the movies themselves!! And that crazy Don Martin had what is probably the most unique cartoon style of all time! Ditto his outrageous sound effects! Yup, I, too, was a huge fan. Phooey. I can’t “Like” this post. It just doesn’t work. Well, I did like it. A LOT!!!!!! What??? The Like button has come a cropper?? That is completely outrageous and unacceptable!!! A Like from The Tuneful Tuna is worth more than a WordPress bowling trophy or any other honor!! “come a cropper” — Ha!! Love that expression! I’ll try Safari tomorrow. Maybe Opera, too. I’m using Chrome right now. I do have to sign into your site now, never did before. So maybe the Like buttons behave differently as a result. Ha! Yes, I’ve always been a big fan of British slang. Probably comes from reading too much Sherlock Holmes, Agatha Christie, and P.G. Wodehouse! To come a cropper, is certainly a great example.